Filed under Cooking Class - Family, Main Meals, Recipes. You can follow any responses to this entry through the RSS 2.0 feed. You can leave a response, or trackback from your own site. The hidden eggs looks great when you cut it open like that. It feels like years since I’ve had meat loaf, but it’s certainly a good satisfying meal in winter. Yayy it’s like finding treasure! How fun ^^! Hmm wonder if it’s possible to put soft boiled eggs in though? Hi Anita! It was great meeting you at Zumbos today, even if we never really got the chance to chat! 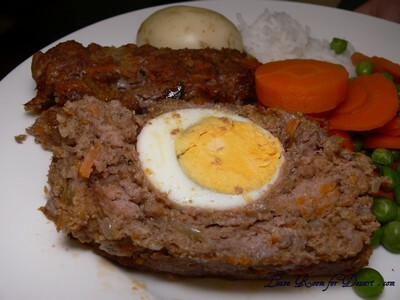 I haven’t really ever had much meatloaf before, but this sounds good, a little like an over-sized scotch egg! 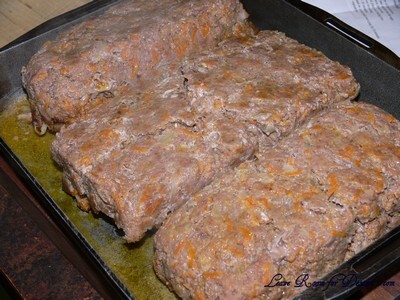 funny enough I have never tried meatloaf…even when living in the states…should give it a go! 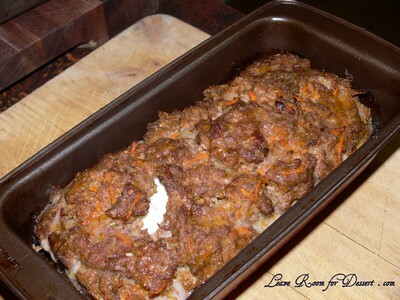 I always wanted meatloaf as a child as that’s what the families on tv ate but never had it. Love the idea of the whole boiled eggs inside it too! Looks fabulous and I love how the yolk stayed so yellow in colour. 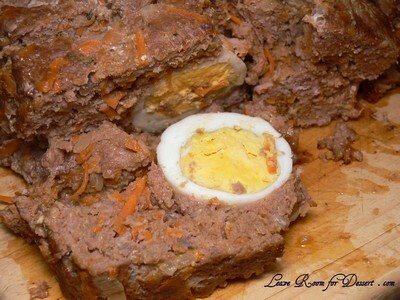 egg in meatloaf! how genius. It would be a nice surprise indeed! I love finding surprises in my food, as long as they are good ones! Hi Arwen – It is great winter food, and it must have been 15 years or something since I had eaten Meatloaf. Hi FFichiban – I like the sound of that!! Nice yolk going through the meatloaf… good thinking, just hope the egg could be peeled easily enough without breaking… hmmm. Hi Chris – Great meeting you too! I had a fantastic time at Zumbo’s, looking forward to chatting with people more next time 🙂 Hehe, the meatloaf is sort of like a big meatball. Hi Alexandra – yep, i think it’s time to give it a go. hopefully I can improve on this recipe and post another in the future. Hi Sophia – It is a great combination. 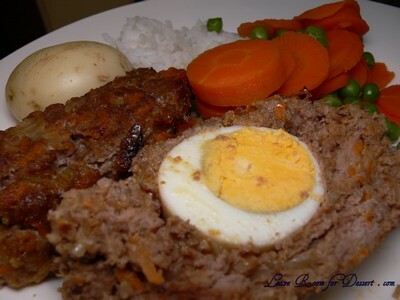 We actually had the pleasure of tasting this dish in Curacao. 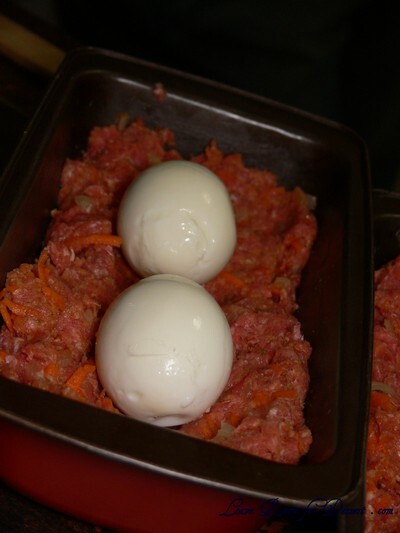 Only we each had our own meatball, inside of which we were surprised with a boiled egg. The sauce on the meatball was a curry sauce…it was delicious…reminded us of our youth….Monday was always meatball day, apparently in Holland it’s on Wednesday….try it this way, you’ll luv it, so will the kids. 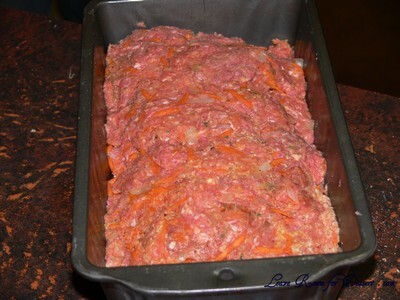 The first time I ever had meatloaf was made this way. I never knew my mom’s secret. I miss her.